Unheated, Ceylon, Violet, Purple and Padparadscha Sapphires. 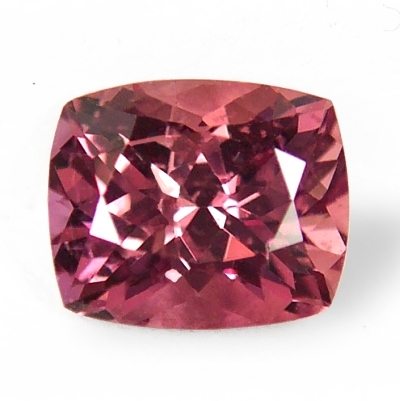 Exotic & delightful, rare hue, hot orangish-pink, unheated, Ceylon sapphire. A very beautiful, unheated, Ceylon "fancy" sapphire weighting 1.37 cts., medium-dark, very intense & saturated, slightly orangish, pink color, masterly executed, rectangular, "antique" cushion, mixed cut, and measuring 7.06 x 5.13 x 3.91mm, eye flawless, VVS1 from the gem fields of Marapana, Sri Lanka. What's in a name? I definitely think this one would be classified as Padparadscha. I give a 80% primary hot pink and a 20% orange undertone. During my recent trip to Asia I saw few, labeled "padparadschas" by GRS, a reputable gem lab, where the sapphires were pure pink with 0 (no) orange...go figure.... Fantastic sapphire that is very well priced. As clean & well cut as it gets. Sweet, well cut with unique color, unheated, Montana green sapphire. A very rare & beautiful, Montana sapphire, weighting 1.13 cts., a beautiful shade of light "metallic lime green", masterly executed, "antique" cushion, mixed cut, measuring 7.14 x 4.71 x 3.44mm, eye flawless, VVS1 from the the Eldorado Bar, Missouri river, near Helena, Montana. A very crisp, diamond-like sapphire with a rare light green color & unique eye appeal. This was purchased in rough form during the nineties (together with an around 50 pieces parcel), when a renaissance of amateur mining resumed on the river banks of the Missouri river in Montana, USA. Cut & polished by our Sri Lankan cutter. 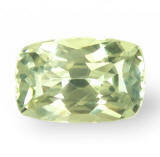 A most delightful, no heat, diamond-like, light green sapphire. 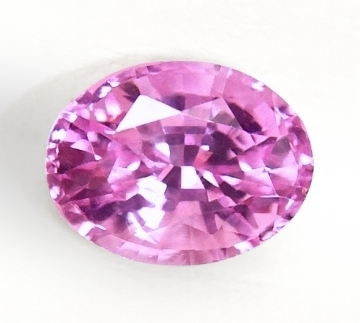 Sensuous, lovely color, very well cut & clean, unheated, Ceylon pink sapphire. A sensuous, unheated, Ceylon fancy sapphire, weighing 1.19 cts., pastel, pink color, perfectly executed, oval, flower cut, and measuring 7.23 x 5.90 x 3.59mm, eye flawless, VVS2 in clarity, from the gem fields of Balangoda, cut & polished in Ratnapura. As per 2019, unheated sapphires are extremely scarce and have reached exorbitant prices. 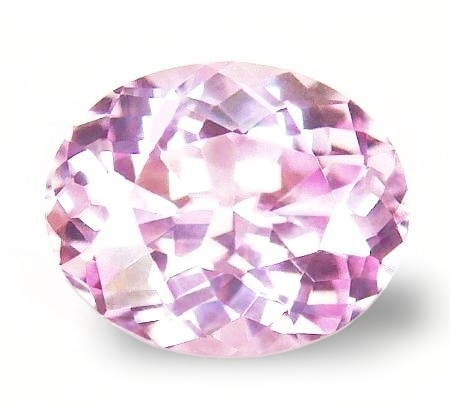 This is a beautiful, pastel pink sapphire with fine cutting & polish, that will make a fine addition to your existing collection or will set well in any jewel. Very sweet, perfectly cut & clean, unheated, Ceylon orange sapphire. I love this Ceylon orange sapphire. It weighs 1.20 cts., pastel, orange color (light tone), perfectly executed, oval flower cut, and measuring 7.30 x 6.19 x 3.49mm, eye flawless, VVS2 from the gem fields of Kuruvita, cut & polished in Ratnapura, Sri Lanka. These pastel orange sapphires are rare. More of a light colored rose, but this gem exudes brilliance and crystal quality only found in the nicest, natural, unheated & untreated sapphires. Great price considered the rarity of pastel orange sapphires. Utterly unique, bronze color change to light copper, unheated, Madagascan sapphire. 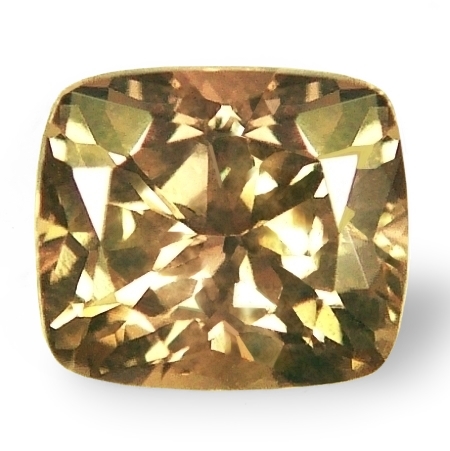 If you are looking for a modern, earthy colored, unheated sapphire, here this 1.02 cts., an unique 'bronze" color in daylight, changing to "light copper" color in incandescent light, masterly executed, in our signature cut, "antique cushion, flower" shape, and measuring 6.08 x 5.27 x 3.50mm, VVS2 from unknown Madagascan mine. Enchanting no heat sapphire, inundated with exotic scintillation & unique color change. All in all, either to set or collect, this material is becoming rare nowadays. Great price for this unique beauty. Amiable, rare color & well cut, unheated, Madagascar "fancy" sapphire. A very rare colored, unheated Madagascan sapphire, this one weighting 0.82 cts., medium-dark, "burnt" reddish-orange color, masterly & perfectly executed, "antique" cushion, mixed cut (with "flower" pavilion) and measuring 5.57 x 4.64 x 3.38mm, eye flawless, VVS2 from the gem fields of Ilakaka, Madagascar. What an unique & modern color. Not quite a padparadscha, because of the "burnt" brownish tones, but nevertheless a mesmerizing & exciting, completely natural, unheated sapphire that is cut to perfection and shimmer with unique hue in any light conditions. 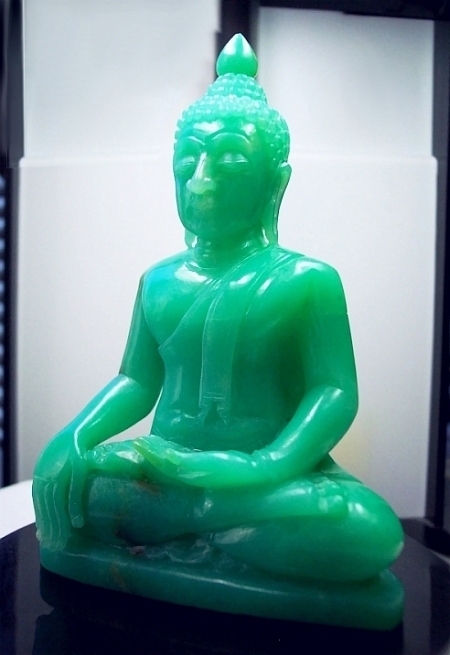 One-of-a-kind, fine blue-green color, "Meditating Buddha", untreated chrysoprase carving. A most excellent, Australian Chrysoprase carving depicting a serene, Meditating Buddha up for sale. Rare piece in the finest, medium, vivid blue-green color, weighting 214.25 grams (1.071 cts.) in weight, and measuring 110mm high x 71mm wide x 35mm deep, very clean & detailed surface (with only few, minor darker spots of rock host on the back of carving). The color is simply magnificent. While chrysoprase can get sometimes darker in color (we have few cabochon pieces slightly darker), it is this medium, vivid bluish-green that it is the most sought after, beautiful & prized. Very rare piece...in this fine color and size/uniqueness. Enthralling, unique bi-color, unheated, purple-orange, Ceylon "fancy" sapphire. Definitely beautiful, finely cut & lustrous, unheated, Ceylon yellow sapphire. Who says the size matters? This unheated, Ceylon yellow sapphire weights 0.89 cts., medium, vivid, "lemon" yellow color, masterly & perfectly executed, oval, "flower" cut, and measuring 5.9x5.03x3.67, eye flawless, IF-VVS1 from the gem fields of Elahera, Sri Lanka. 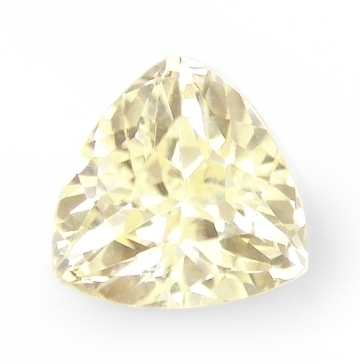 Yes, a bit less than 1 ct., however this yellow is blessed with top unheated color, perfect cutting and a scintillation that captivates the senses. And what a low price for this beauty. Guaranteed beautiful or your money back 110%. Gorgeous yellow sapphire here. Rare color, unheated, royal blue color change to purple, Ceylon fancy sapphire. If you like a deep, royal blue with a color change to deep purple, you should consider this unheated, Ceylon sapphire, that weights 1.04 cts., royal blue color in daylight, changing to deep purple in incandescent light, well executed, oval, mixed cut, and measuring 6.37 x 5.40 x 3.71mm, eye flawless, VVS1-2 from the gem fields of Marapana, Sri Lanka. Gorgeous deep, royal blue color in daylight, well cut and clean with perfect color change, this unheated, Ceylon sapphire is offered at a great price. 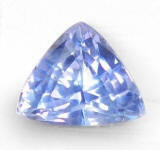 Unique, well cut and clean, unheated, color change, Ceylon fancy sapphire. 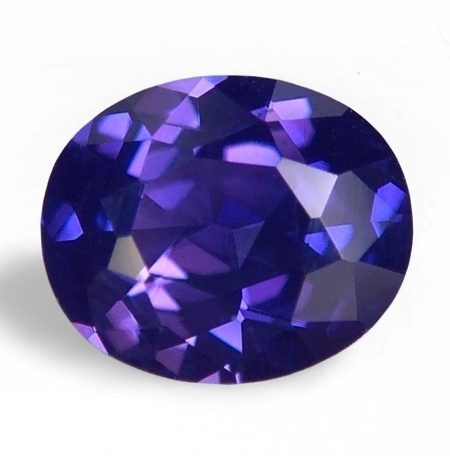 A lovely, unheated, Ceylon color change sapphire, weighting 1.21 cts., medium-deep, bi-color, violet-purple and blue blended colors in daylight, changing to deep purple color in incandescent light, masterly executed, oval, mixed cut, cut for large appearance, and measuring 7.30 x 6.05 x 3.43mm, eye flawless, VVS1 in clarity, from the gem deposits of Elahera, Sri Lanka. Nice face sapphire, with a nice, blended blue-violet-purple color in daylight that will change to purple under incandescent light. Great price. 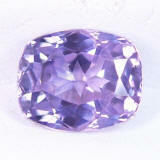 Captivating and exotic, rare color, unheated, Ceylon pinkish-purple sapphire. Beautiful. What a gorgeous and rare color in sapphire. 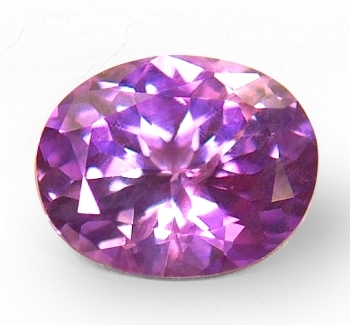 This unheated, Ceylon fancy sapphire weights 1.36 cts., medium, vivid, pinkish-purple color, v.slightly bluish, shifting to a more pure medium-dark purple (with pink flashes) under incandescent light, perfectly executed, "antique" cushion, mixed cut, and measuring 7.2x5.6x3.4mm, eye flawless, VVS1 from the gem fields of Pelmadulla, Sri Lanka. Superb no heat sapphire with the shade of a wild orchid. Perfect cut, great spread, super clean and exotic color. A most beautiful, unheated, Ceylon fancy sapphire. 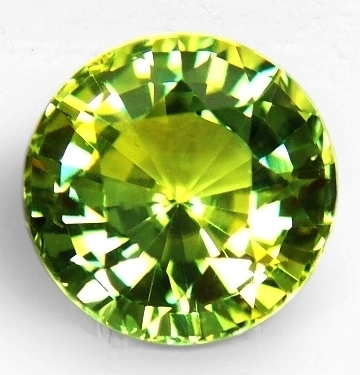 Dazzling, 3rd party certified unheated, rare, yellowish-green Montana "fancy" sapphire. Very beautiful. A very rare color from a special location. This completely unheated, green sapphire weights 2.32 cts., medium, vivid, "parrot" yellowish-green color, masterly executed, round, mixed cut, measuring 7.5-7.6mm in diameter by 5.10mm deep, eye flawless, VVS1 from the Eldorado Bar, Missouri river, near Helena, Montana. A beautiful Montana sapphire with a vibrant green color. Needless to to say, this is a super rare sapphire from the Montana's Missouri river deposits. Completely untreated & unheated, round in shape, exotic in feel,... destined to a very special person. Have it certified by CSL Sri Lanka. 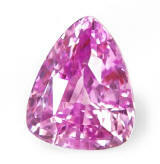 perfectly cut with clean clarity, certified unheated, Ceylon pink sapphire. Great size, beautiful. A ravishing, certified unheated, Ceylon pink sapphire weighting 2.11 cts., medium, vivid, pink color, slightly purplish in undertone, masterly executed, oval, mixed cut, measuring 8.22x6.72x4.57mm, eye flawless, VVS2 from the gem fields of Elahera, Sri Lanka. Completely unheated pinks are one of the rarest color in the sapphire world, only second to the orange-pink variety called Padparadscha. Anything over two carats in size, clean and well cut like this one, will sell very high in any venue. Accompanied by a SGL (SanGems Laboratories, Colombo, Sri Lanka) certificate stating "no indications of heating" detected. 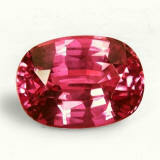 Magnificently lustrous, gorgeous "shield" cut, low heat, Ceylon pink sapphire. 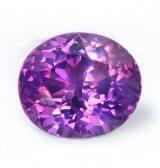 Mysteriously one-of-a-kind, unheated, color shift, violet to pinkish-purple, Burmese "fancy" sapphire. Great cut. 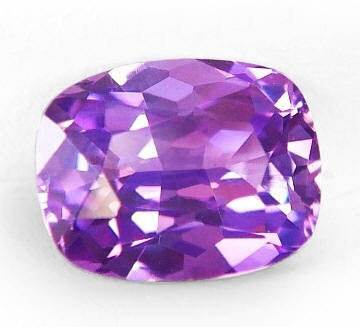 Another very unusual color from an important location, this Burmese, unheated "fancy" weights 0.92 cts., medium, strongly saturated, violet color in daylight shifting/changing to saturated pinkish-purple in incandescent light, perfectly executed, oval, "flower" cut, measuring 6.5x5.46x3.32mm, eye flawless, VVS2 from the gem fields of Mogok, Upper Burma. The gem fields of Mogok, apart from producing the finest rubies in the world, are home of many fancy colors sapphires. Another characteristics of the Mogok tract mines is that all these rubies and sapphires do not require any heat treatment. A great specimen! 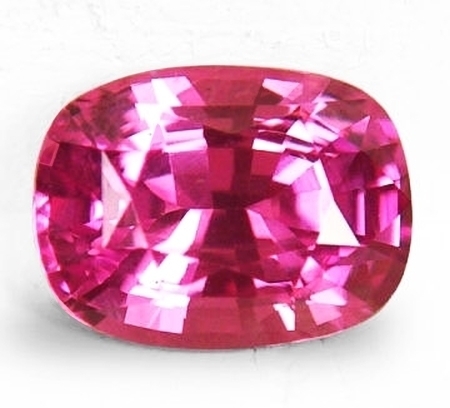 Finest hot pink color, absolutely rare, unheated, Ceylon pink sapphire. Exquisite. What a vivid color, and what a beautiful sapphire! This completely unheated, Ceylon pink sapphire weights 0.92 cts., top, intense & vivid, hot pink color (with great saturation), masterly executed, rectangular, "antique" cushion, mixed cut, measuring 6.13x4.87x3.3mm, eye flawless, VVS2 from the gem fields of Nivitigala, Sri Lanka. Just a tad less than 1 ct., this gem is blessed with superb, extremely rare hot pink color, our signature antique cushion "flower" cut, clean clarity and phenomenal eye appeal. And at this price, ...simply ridiculously low. 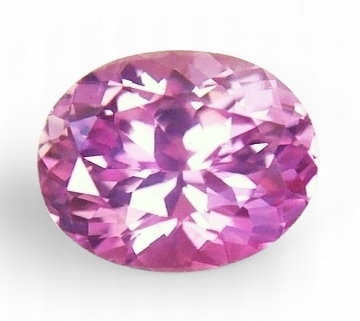 Candy-like presence, vivaciously exciting, unheated, Ceylon purplish-pink sapphire. A beauty. A most gorgeous, Ceylon pink sapphire up for grasp here. It weights 0.97 cts., medium, intense, purplish-pink color, masterly executed, oval, "flower" cut, measuring 6.35x5.26x3.66mm, eye flawless, VVS1 from the gem fields of Ratnapura, Sri Lanka. Fantastic presence this purplish-pink has. An exotic gem that is clean, very well cut, and completely natural with no treatments whatsoever. These unheated pinks are very hard to come by and skyrocketing in price. And we get only the finest & clean gems and we offer them at the lowest, below wholesale price. A no brainer. 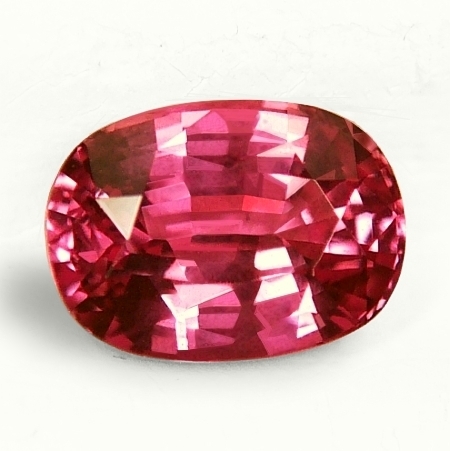 A delightfully serene, rare, Ceylon unheated, pure pink sapphire. Hard-to-get quality...very lovely. 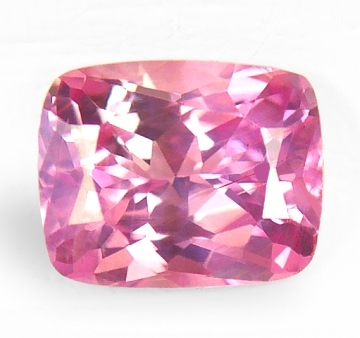 Unheated pinks are possibly one of the most expensive sapphire color. They often surpass in value fine blues and approach very closely the most sought after orange-pinks Padparadschas. This one weights 1.30 cts., medium, fine, pure open "pink" color, perfectly executed, oval, mixed cut, measuring 6.73x5.4x4.3mm, eye flawless, VVS to VS type2 from the gem fields of Balangoda, Sri Lanka. Do not hesitate on this awesome, unheated pink because they are very scarce and difficult to obtain. Great sapphire at a great price. Deliciously perfect, beautifully cut, unheated, Ceylon color change, "fancy" sapphire. Sensuous. 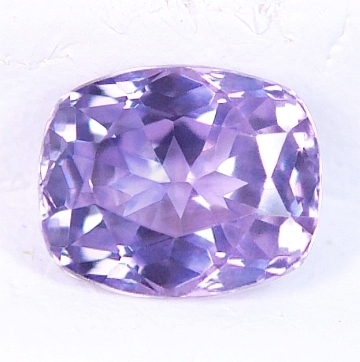 A beautifully unique, unheated, Ceylon "fancy" sapphire with a color change, weighting 1.12 cts., medium, pure violet color in daylight, changing to medium violetish-pink color in incandescent light, masterly executed, "antique" cushion, with "star" cut pavilion, and measuring 6.21x5.1x3.64mm, eye flawless, VVS1 from the gem fields of Balangoda, Sri Lanka. Sensuously charming, this rare, pure violet color has also a color change to indoor/restaurant lights. Well cut & with superior clarity too, priced at true wholesale. We are the source of completely natural, unheated, Ceylon sapphires of superior quality and wholesale prices. Gorgeously charming, well cut with beautiful color, unheated, Ceylon "Padparadscha" sapphire. Very rare. Gorgeous, unheated, Ceylon "padparadscha" sapphire weighting 0.95 cts., medium, rich & velvety, orangish-pink color, masterly executed, "antique" cushion, mixed cut, measures 6.02x5x3.39mm, eye flawless, VS1 from the gem fields of Kuruvita, Sri Lanka. A real fine colored "padparadscha" sapphire, with fine cutting, great clarity and of course, wonderful and unique eye appeal. "Padparadschas" are the rarest of all color sapphires and very difficult to come by, especially in strong colors like this one. Do not delay on this one as it is a great value and a beautiful one! 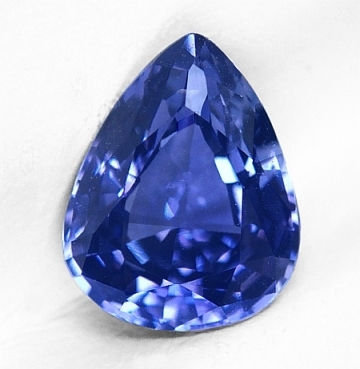 Exotic, very brilliant, unheated, color change, bluish-violet, Ceylon sapphire. Great cutting. 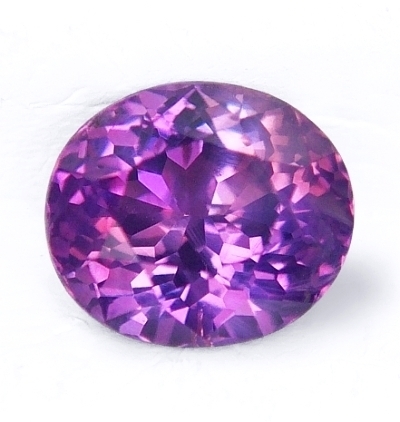 Simply lovely, unheated with color change, Ceylon violet sapphire, weighting 1.09 cts., pastel, violet color in daylight, slightly bluish in undertone, changing to pinkish-lavender color in incandescent light, perfectly executed, "antique" cushion, mixed cut (with "flower" pavilion), measuring 6.55x5.29x3.45mm, eye flawless, VVS2 from the gem fields of Elahera, Sri Lanka. We do not hesitate in stating that we are the best source for fine unheated, Ceylon "fancy" sapphires anywhere. Our affordable prices for the quality offered cannot be matched by anybody, here in the States, in Bangkok and even at the mine site. Start your collection of unheated "fancy" today. 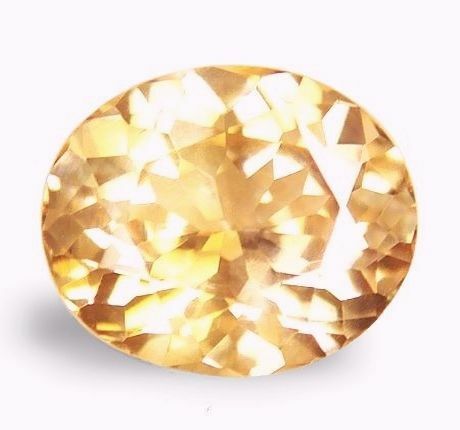 Brilliantly seductive, perfectly cut, unheated, Ceylon "faint yellow" colored sapphire. A great addition to any collection. 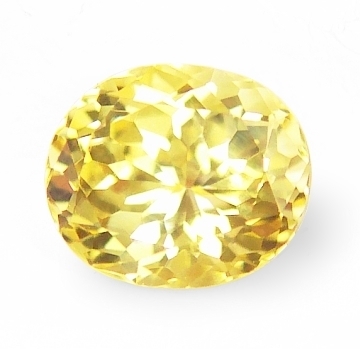 If you like perfect brilliance, then you should consider this unheated, Ceylon sapphire, which weights 1.03 cts., very light, "buttery" yellow color, masterly executed, trillion, mixed cut, measuring 5.9x5.9x5.9 by 3.83mm deep, eye flawless, VVS1 from the gem fields of Ratnapura, Sri Lanka. 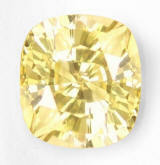 Beautifully cut, this natural, no heat sapphire displays an exciting scintillation in a light, buttery yellow body. As clean as it gets, as natural as it gets, perfect for a budget project or just add it to your colored stone collection. 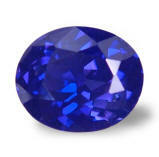 We are the source for fine, unheated sapphires in every color at or below wholesale. We allow a 10 full days return policy, "no questions" asked. Why would you pay 3 or 5 times more for the same quality? Magical, definitely rare, perfect color change from violetish-blue to purple, Ceylon "fancy" sapphire. Effulgent, superior cutting, flawless, unheated, Ceylon yellow sapphire. Beautiful. Brilliantly exotic, very well cut, unique, unheated, Ceylon blue-violet sapphire. Very lovely. Very unique, unheated, Ceylon "fancy" sapphire weighting 1.07 cts., pastel, blue-violet color (light cornflower), well executed, trillion, mixed cut, measuring 5.7x6.8x4.12mm, eye flawless VVS1 from the gem fields of Elahera, Sri Lanka. Unheated sapphires are skyrocketing in price by the day. Just browse around and see prices for the same (and most of the time lesser) quality, 3 to 5 times our prices. It is no brainer. However, we are raising our prices, so act quickly. Very lovely sapphire this one with great cutting and sweet overall feel. 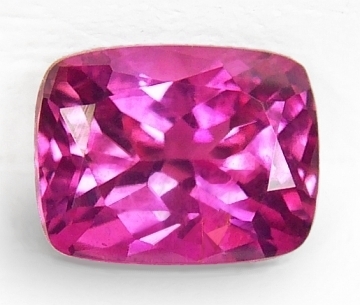 Magnificent, super hot color, perfect cushion cut, low heat, Ceylon hot pink sapphire. A superb, gently slightly heated, Ceylon "fancy" sapphire weighting 1.68 cts, finest, vivid, hot pink color, masterly executed, "antique" cushion, mixed cut, measures 7.56x5.93x4.22mm, top eye flawless, VVS1 from the gem fields of Elahera, Sri Lanka. Needless to say, this vivid hot pink color, almost approaching a ruby, is rare. Add the perfect cushion cut and finest, flawless clarity and you have a sapphire that will not disappoint you. This one has been low heated in the local mining area using the "blowpipe & charcoal fire" heat. Usually this low heat applied, does not produce any major crystal changes, and often a gem lab will detect a sapphire heated this way, as "unheated". Gorgeous. 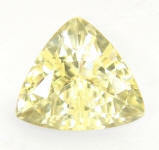 Simply lovely, very well cut "antique" cushion, bright & lively, unheated Ceylon yellow sapphire. Simply lovely! This unheated, Ceylon yellow sapphire weights 1.04 cts., medium, pastel, pure yellow color, masterly executed, "antique" cushion, mixed cut, measuring 5.97x5.35x3.68mm, eye flawless, IF-VVS1 form the gem fields of Balangoda, Sri Lanka. A sunshine yellow with a most awesome cutting. Translated in a very sweet eye appeal, full of luster and amiable feel. Clarity is perfect as well. We are the source of fine, clean & well cut unheated sapphire from Sri Lanka, Burma Montana and other locations at the dealer prices. Be confident about our quality, and most importantly (unless you do not care about savings) about our wholesale/dealer prices.